The Cougars lost to Stanford at home in a heartbreaker in 2015. Now, armed with their 20 seniors, they need to beat Stanford to stay alive in the Pac-12 title race. 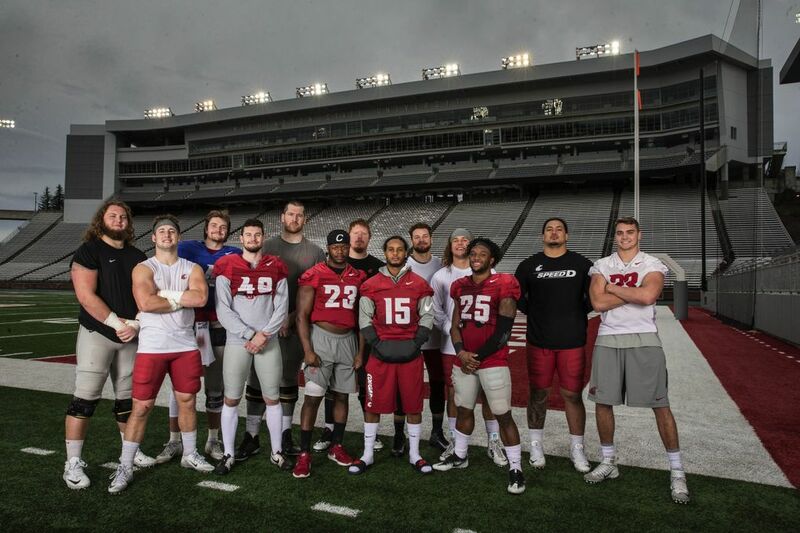 The goal for this Washington State senior class was a Pac-12 championship. So perhaps it’s fitting that on Senior Day this Saturday, that’s exactly what they’re playing for. Beat No. 18 Stanford, and WSU retains control of its own destiny, chugging toward a Nov. 25 Apple Cup duel with Washington that could double as a play-in game for the Pac-12 North berth in the conference championship game. Lose to Stanford, and the dream of winning a conference championship fades into the background as UW and the Cardinal would have to trip down the stretch to give WSU any hope of jumping back in the title chase. Stanford has derailed WSU’s Pac-12 championship ambitions before. Against the Cardinal at Martin Stadium in 2015, with WSU trailing 30-28 in the final seconds, kicker Erik Powell attempted what would have been the game-winning 43-yard field goal, only to pull it wide. Stanford won the Pac-12 North that year with an 8-1 record in conference play. Oregon finished second, at 7-2, with WSU third, at 6-3. If the Cougars had beaten Stanford, they would have emerged as Pac-12 North champions with a 7-2 conference record with a head-to-head win over Oregon. Now, it’s déjà vu as 25th-ranked WSU gets a do-over at home against the Cardinal, once again with Pac-12 title hopes on the line. With such a high-stakes game looming, it’s no surprise that WSU coach Mike Leach, in his usual no-nonsense matter, was hesitant to talk much about the significance of Senior Day this week. “To be perfectly honest, it means very little because we’re gonna be preoccupied to go out there and play a game, and then we’re gonna have three more games after that, at least. Maybe four,” Leach said. He did, however, acknowledge the impact this class has had on the program. Fourteen of the 20 seniors signed with WSU in 2013, when the Cougars were coming off a 3-9 campaign and had not been to a bowl game in a decade. All 20 started the season in the two-deep. WSU will recognize the following 20 seniors before the game: P Mitchell Cox, LB Nate DeRider, WR C.J. Dimry, LB Isaac Dotson, DT Daniel Ekuale, QB Luke Falk, RLB Dylan Hanser, WR Robert Lewis, RLB Frankie Luvu, OT Cole Madison, DT Garrett McBroom, RB Jamal Morrow, OG Cody O’Connell, DB Kirkland Parker, LB Peyton Pelluer, CB Marcellus Pippins, K Erik Powell, OG B.J. Salmonson, FS Robert Taylor, RB Gerard Wicks. Regardless of what happens in the next few weeks, they will leave WSU as the class that reinvigorated the program. In the last four years, this class has accumulated 27 wins and made it to two bowl games, winning one. WSU also enters the Stanford game with 17 conference wins in the last three seasons – third-most in the Pac-12 behind Stanford (19) and USC (18). “They’re definitely responsible for turning this whole program around, for their work ethic and just coming out every day and just being great role models, they’re definitely responsible for the turnaround of this program,” junior receiver Kyle Sweet told reporters in Pullman this week. This senior class is unique in that it represents every position on the team. At quarterback, Falk has won more games than any other before him and will probably own every Pac-12 passing record by the end of his career. Morrow, at running back, has been WSU’s steadiest, most productive skill player, and he leads the Cougars with eight touchdowns. On the offensive line, O’Connell and Madison are highly acclaimed and will likely make it onto NFL rosters. On special teams, Powell is off to a 14 of 17 start on field goals, he converted a career-long 56-yarder last week, and was just named a semifinalist for the Lou Groza Award. Defensively, the Cougars have leaned on tackles Ekuale and McBroom up front, and Pippins and Taylor in the secondary. Linebacker was the deepest position on the roster at the start of the year, but Pelluer and DeRider suffered season ending injuries in the first half of the season, while Dotson has not played since he left the Oregon game with an undisclosed injury, and his return this year is questionable. Hanser and Luvu are the only senior linebackers who have managed to evade the injury bug, and Luvu is enjoying the best year of his career, with 5.5 sacks. WSU began the season full of hope, with a Pac-12-high 17 returning starters. Through the first month, the charmed season appeared to live up to all expectations as the Cougars raced to a 6-0 start that shot them to No. 8 in the national top 25 rankings and included a signature upset win at home over then-No. 5 USC. But everything unraveled in an embarrassing 37-3 road defeat to Cal on Oct. 13. A shutout win over Colorado kept the Cougars’ championship hopes alive, yet those took another big hit last week, when the Cougars’ flaws were exposed in a 58-37 loss to Arizona. Against Stanford, WSU will either get back on track, or see its Pac-12 championship hopes slip away for good.